Pet Rescue & Adoption Service was formed to help save cats and dogs of all ages from unnecessary euthanasia and situations of abuse and neglect and we also take surrenders of pets from people for a variety of reasons. We also take in many kittens from all walks of life. In some cases we may sterilise the owned mother when we take the kittens. 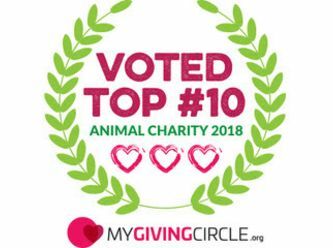 We respect and support other rescue organisations and strive to be part of the total process of freeing our companion animals from suffering. PRAAS is a self-funded, not-for-profit organisation. All work is done by unpaid volunteers. All vetwork & most food, toys, equipment etc are paid by the Rescue owner. The remainder is paid by the Carers. All transport fuel is paid by the owner, carers & other volunteers. Our rescued pets live as fosters in a home environment. Each might live with a family, a single, cats, dogs, other animals, children etc & it will be included on their profiles in which kind of environment they are known to be comfortable. All cats live inside only; where possible this includes a secure outdoor run. They are also fed a very high quality, nutritious diet as I believe that this is part of basic care for our loved pets. We require our adoptive families to have the same attitude towards their new pet's nutrition and to feed them similar quality food. A vital part of rescue involves desexing every animal that passes into our care and education of the importance of this process to members of the public with whom we come into contact. No animal will be adopted without first being microchipped, vaccinated and either desexed or with a paid certificate for desexing at the appropriate size. Desexing is THE key to the total well-being of our pets and the value that people place on them. Only in rare circumstances will desexing not occur e.g. if the animal is elderly or frail & it is advised by the vet to be unnecessary or dangerous. Once our rescued pets are healthy, desexed and have had all the necessary work according to current legislation, they will be offered to the public for adoption. New families will be carefully selected. All animals are adopted with the expectation that finally, this will be their lifelong home. When you see the picture, read the profile & think "This is the one!" I want to hear from you! Just click the Enquiry form below here so I can send you an application form. Although it's important for these adoptees to find their forever homes asap, there will be an informal interview process to see if you both match. This is the difference between adopting & buying and it serves the really important purpose of keeping you together for life. All family members will be included in the adoption process. Everyone counts. Once it's been decided that you will trial your possible family member, you will complete the adoption form, pay the fee & take him/her home to see for sure that the fit is right. The settling in process can take some time or it may be almost instant. If after a while it becomes apparant that the chemistry just isn't there, the animal can be returned for a full refund. Please be aware that this is not a failure for either you or the adoptee. It simply didn't work & there is no blame. If the adoption goes ahead but some unforseen circumstance arises in the future where you must be separated, your pet MUST be returned to PRAAS; not rehomed by yourself. We have rescued that animal & we need to know that he/she is safe for the rest of its life. It may be that you have a wonderful next home to move them to, in which case please let us know. Bursting with energy & changing every day, Matrix is all black. He is the biggest and boisterous and playful. They are growing up in a big human family including young children so are accustomed to all the loud noises! These babies are big for their age and mum Lara was in rescue care for her entire pregnancy, being fed the very best food, vet-checked, wormed and cared for in every way as she grew her babies. The kittens were weaned onto solid food of the highest quality and are having all the vet visits they need. The foster carer fell in love with not only mum Lara, but the other 2 kittens in the litter as well so the ginger & very dark tortie are not available! More photos will be added as they're taken. For their safety and your own peace of mind all our cats must live indoors only. A secure cat enclosure would be a wonderful bonus for them but an enriched household (with cat towers, scratchers & plenty of toys), some good window seats & views of outside perhaps with a screen door or window to look through & sniff the breeze, and lots of attention should be adequate. 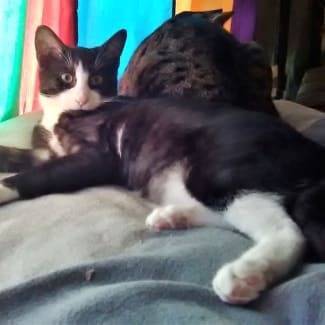 Although not technically a bonded pair, this brother & sister, Matrix and Molly, would absolutely love to live together the rest of their lives. Located in Yanchep. Bursting with energy & changing every day, Molly is tortoiseshell & white. She is the smallest and was the quietest one but loves getting into mischief. She loved sleeping close to Mum but lately has preferred to sleep with her human family. She is growing up in a big family including young children so is accustomed to hustle & bustle! These babies are big for their age and mum Lara was in care for her entire pregnancy, being fed the very best food, vet-checked, wormed and cared for in every way as she grew her babies. The kittens were weaned onto solid food of the highest quality and are having all the vet visits they need. The foster carer fell in love with not only mum Lara, but the other 2 kittens in the litter as well so the ginger & very dark tortie are not available! More photos will be added as they grow. For their safety and your own peace of mind all our cats must live indoors only. A secure cat enclosure would be a wonderful bonus for them but an enriched household (with cat towers, scratchers & plenty of toys), some good window seats & views of outside perhaps with a screen door or window to look through & sniff the breeze, and lots of attention should be adequate. Although not technically a bonded pair, this brother & sister, Molly & Matrix, would absolutely love to live together the rest of their lives. Located in Yanchep. Tommy has beautiful mackerel tabby markings and has grown into a big boy so he stands out from the crowd. His nature is on the quiet and laid-back side and he often observes life from his reclining position, though still being kittenish he frolics and plays, enjoying every moment of life. He loves all the cat company but a short while ago he suddenly seemed to discover what human attention had to offer & began to walk up asking for pats and strokes instead of simply accepting what was offered. He has surprised me by becoming quite a snuggle-bunny, when I thought he was always going to be more reserved! He surely has come a long way from early beginnings when I nicknamed him growl-baby! His short coat is glossy and easy to care for. In fact he will take care of it himself as long as you continue to provide the quality diet! Tommy temporarily changed foster homes to expose him to a busier lifestyle with more bustle and children, including a typically boisterous toddler, and he managed well. It took him a couple of weeks to shake his reservations but suddenly he was loving life there and we know he will definitely take to any cat-friendly children. Initially shy with a stranger, he is really worth the wait to get to know. 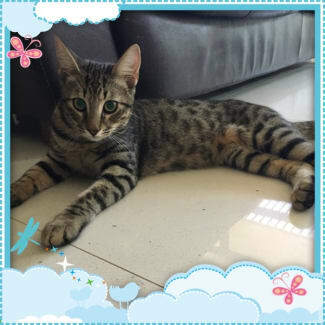 He has grown up with plenty of other cats of all ages, two sizes of cat-savvy dogs and was snuggled a lot by children during his initiation into indoor life. He will fit into most types of home and family who can take the time to let him come out of his shell at his own pace. He became accustomed to the loud sounds of his 2nd foster home's toddler, though he kept his distance. Tommy settles happily into new places (such as his second foster home) but he does need to take his own time. Since being back in the original foster house which doesn't get many visitors he is nervous when one appears but if you can see past that, I guarantee you will find yourself with a quiet and very loving cat. Tommy was trapped near the airport with his littermates after an employee noticed their deceased mother on the road. In just a few short weeks he went from being a scared bush kitty to a purring, ever-growing boy bursting with health and loving life. This came about with a diet of premium kitten food and a ton of handling & love from a band of kitty-snuggler volunteers who cuddled & played with them every day for several weeks. It was a crash course in Domestication and Loving Humans! 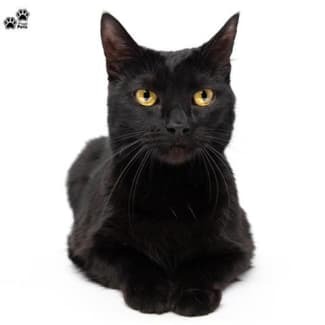 For his safety and your own peace of mind Tommy must be an indoor-only cat, although a secure cat enclosure would be a wonderful bonus for him. But an enriched household (with cat towers, scratchers & plenty of toys), some good window seats & views of outside perhaps with a screen door or window to look through & sniff the breeze, and lots of attention should be adequate. Tommy would like the company of other friendly cats but love from his humans would be ok too. Located in Yanchep. 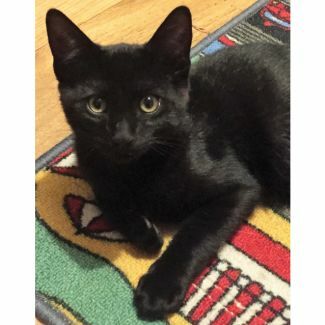 "Cleo is an extremely affectionate and loving girl. She loves her food, cuddles and pats. She likes to snuggle on my daughter’s bed and makes a great study buddy. Cleo purrs a lot when happy. She will make a fantastic pet for someone." - Cleo's foster mum. Cleo was handraised (bottle-fed) so is very much a people cat. 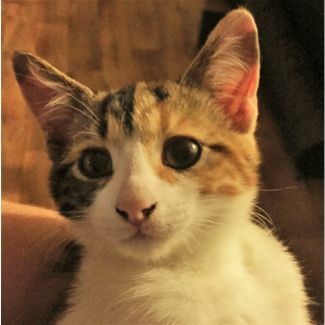 She was originally adopted together with her 2 siblings but after 2 years their home split up so as a result all three had to go their separate ways. After a few days of super-shyness she suddenly realised that her new foster family was A-ok and she began to show her awesome snuggly self. She is a petite little girl and loves to snuggle under her carer's daughter's neck in bed. She also has a habit of sleeping on her carer's chest when she's relaxing in the evening. The foster family already had its own pride of cats and Cleo is taking her time to come to terms with that. She doesn't like the boisterous ones, but has become friends with the quiet cat, so a friendly cat in the home could work. Cleo even began to sniff noses with the resident dog and has now become quite cuddly with him so a friendly, respectful dog is definitely on her list of possibilities with a slow and careful introduction. Cleo is quite friendly with the household's regular visitors and comes out to say hullo. It's nice to have a cat who is happy to see your friends! I believe Cleo's true calling is to be a snuggle cat for someone or a whole family. For her safety and your own peace of mind, Cleo must be an indoor-only cat. A secure cat enclosure would be a wonderful bonus for her but an enriched household (with cat towers, scratchers & plenty of toys), some good window seats & views of outside perhaps with a screen door or window to look through & sniff the breeze, and lots of attention should be adequate. Located in Cannington. I have turned into an amazing little character! I used to be very quiet & kept to myself but now I will run around the house over benches, towers & couch backs to follow my human and get where she's going before she gets there! I just adore being stroked now, where before I wasn't very sure about touch. I also nibble & lick you when I'm excited; it's not hard enough to hurt but small children might be afraid of me. My foster mum is trying to break me of the habit for this reason. I'm a very pretty black smoke tabby & white. The black parts of my fur are actually silver white near my skin, so if I had a buzz cut I'd be a white cat! It's quite a sensational look in real life. I've grown up with a lot of other cats and some friendly dogs too, so I will fit into most households. I've turned into a super-handsome dude! I started out being black and white but my face and front legs have become lighter with faint stripes and I might even keep getting lighter. Now even the underside of my tail has pale stripes! I'm beautifully lean & slim and could probably be mistaken for a purebred whose name you can't quite remember. I ask when I want interaction and apart from chasing you around the house I have a favourite cat stand at just the right height so you can see me and stop to give me a stroke & a cuddle - but I don't get all in your face if you're busy and need to pass by with only a quick head scratch. I just find something else to do with my brothers or toys. I love, love, love playing with the other fosters and resident cats here. My last 2 litter brothers were just adopted the other day & I'm still searching for them which my foster mum finds sad but she knows I'll soon recover. It would be super awesome if I could be adopted with Tommy, my favourite brother from another mother ♥ but I wouldn't mind meeting another cat or even a friendly dog! For his safety and your own peace of mind Finn must be an indoor-only cat, although a secure cat enclosure would be a wonderful bonus for him. But an enriched household (with cat towers, scratchers & plenty of toys), some good window seats & views of outside perhaps with a screen door or window to look through & sniff the breeze, and lots of attention should be adequate. It might be that Finn would be fine without any pets in the house but it's hard to tell at this age since he's still loving playing with the other cats. Located in Yanchep.